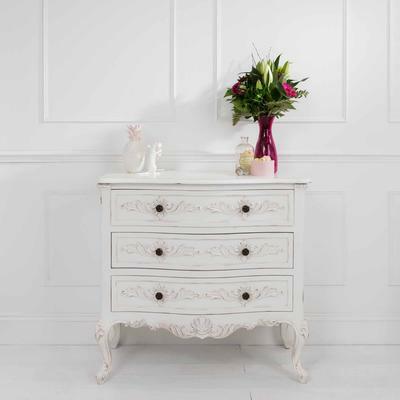 Inject a beautiful shabby chic French inspired touch to your home with this lovely Classic Four Drawer Chest. Designed for those who love abundant storage space, the chest is handmade using sturdy mahogany wood. It features a smooth top surface ideal for holding a lamp, a vase of flowers or a gorgeous set of picture frames. The front part of the chest includes four drawers, two of which are smaller while the other two are the same width as the chest. 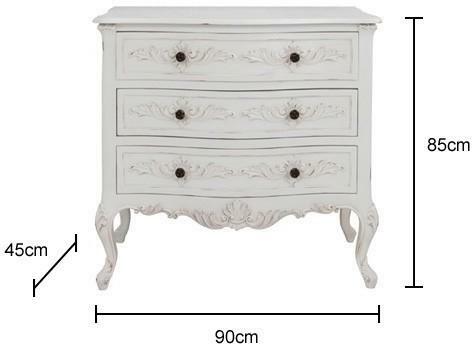 Each of the drawers are embellished with lovely Baroque details including a circular handle for easy opening and closing. The same decorative motif runs along the bottom edge of the chest and extends into the beautiful curvy legs. Add this chest to your living room or use it for storage in your bedroom, it is useful and perfect for keeping smaller items.